Did you know that Hello Kitty's real name is Kitty White? I didn't either. But in doing some research online I found some very interesting facts about the white cat with the red bow. It seems she lives just outside of London, England with her parents, George and Mary! She also has a twin sister named Mimmy. And, one other surprise I found was that she actually has a boyfriend; Dear Daniel! While she may have been created in 1974 in Japan to adorn a coin purse, Hello Kitty has become a world-wide phenomenon.. Whether it is a stylish t-shirt or hoodie, Hello Kitty can be found on watches and jewelry, rain boots and umbrellas as well as kitchen appliances and cell phone covers! 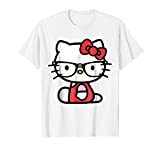 If you love Hello Kitty designs then you will love the large assortment of T-shirts available. They are truly comfortable to wear and come in some beautiful and colorful designs. You can buy these T-shirts for toddlers to women. The clothing line for Hello Kitty doesn't just end at T-shirts either. There are some really unique sweatshirts and hoodies available as well. If you want to get involved in making your own Hello Kitty T-shirt then check out the video below. All you need is a pattern to transfer on a white T-shirt and some fabric paint and you can be as creative as you want! Taking care of 100% cotton t-shirts is important because if it is washed in hot water or in a too hot dryer, it will end up shrinking or fading. The best way to take care of your cotton tee is to wash it in warm or cool water using regular laundry detergent. Although you can dry it on low in a dryer, I find that my t-shirts last longer when I hang them up to dry. I simply put them on a plastic hanger and hang them on the shower rod to dry. Usually they dry overnight or in just a few hours in a warm room. If you still want to dry the t-shirt in a dryer make sure you remove it as soon as the dryer shuts off so the shirt won't get wrinkled. If it does wrinkle you can always use an iron to remove them. If your t-shirt has ruffles, spraying them with starch before ironing can stop the ruffles from curling. Most people like to fold their t-shirts and put them in a drawer or on a shelf but I prefer to hang them in the closet. If find they don't wrinkle as much and are easier to find. What Do You Love About Hello Kitty T-Shirts?